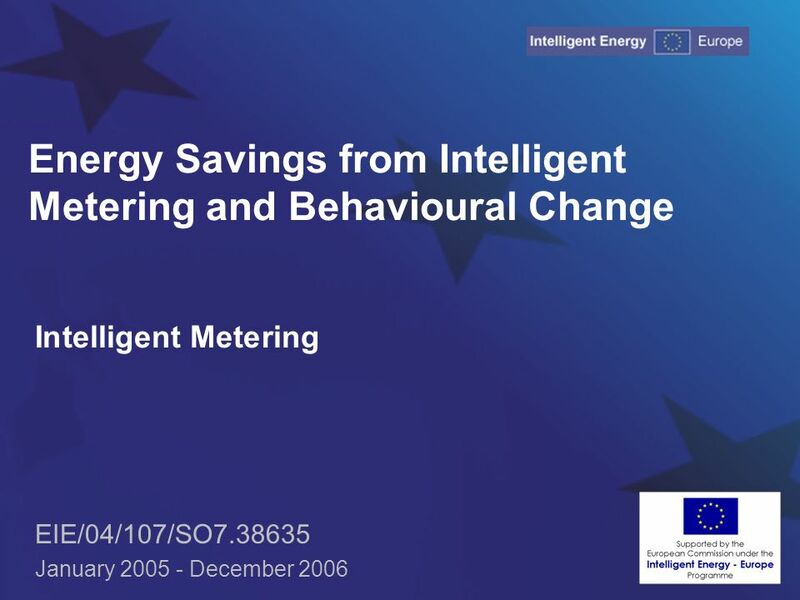 Energy Savings from Intelligent Metering and Behavioural Change Intelligent Metering EIE/04/107/SO7.38635 January 2005 - December 2006. 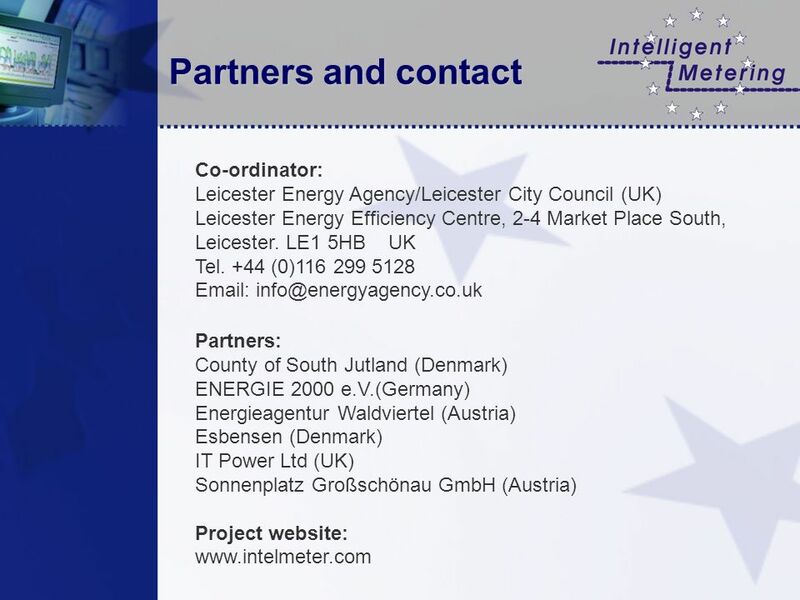 2 Project summary The Intelligent Metering project involves partners in Austria, Denmark, Germany and the United Kingdom. 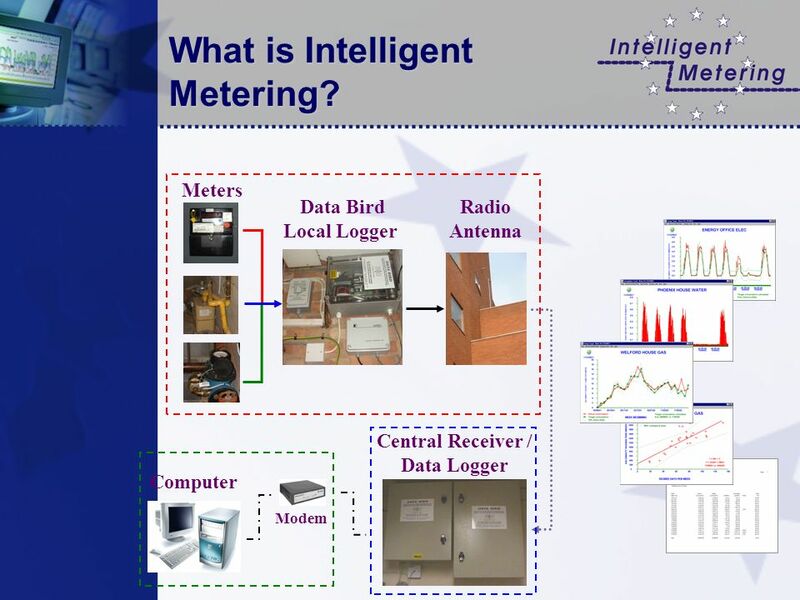 Intelligent metering is being used to obtain half hourly energy and water consumption data for selected local public buildings. 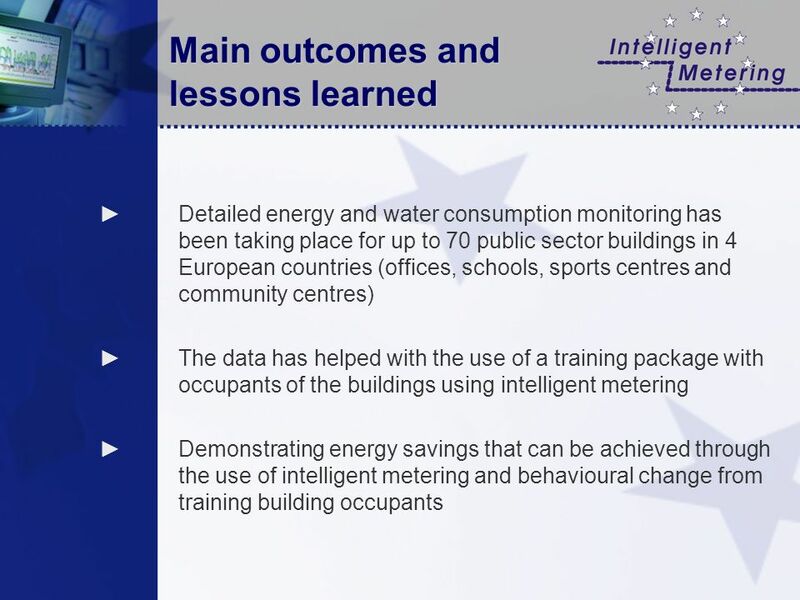 The project aims to demonstrate and promote the savings available from the use of intelligent metering and training occupants in public buildings and to show that these savings can be achieved at little, or no, additional cost. 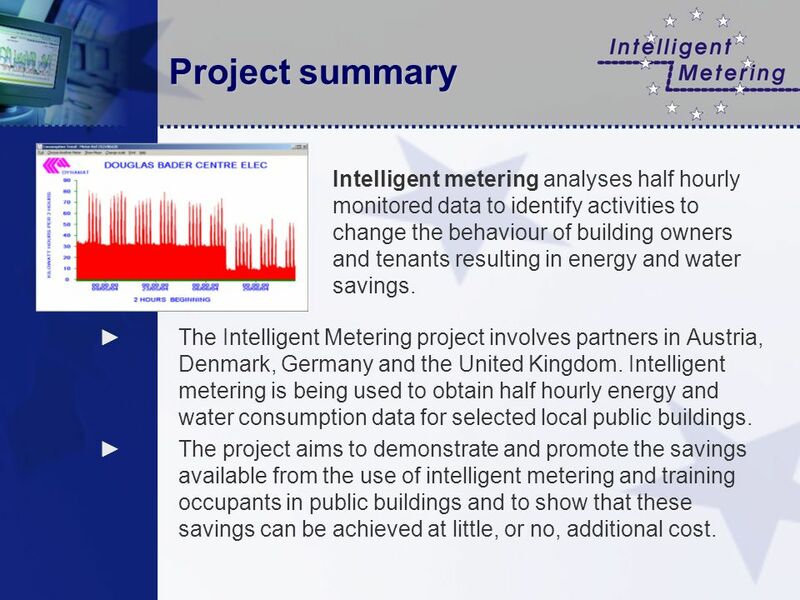 Intelligent metering analyses half hourly monitored data to identify activities to change the behaviour of building owners and tenants resulting in energy and water savings. 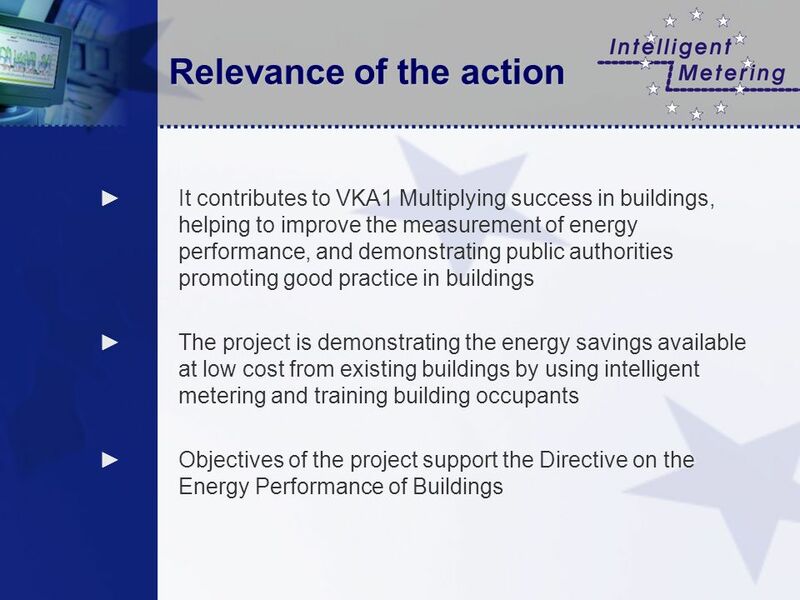 3 Objectives and main steps The overall objective of the project is to maximise the energy savings available across Europe through the use of intelligent metering and behavioural changes of building occupants. 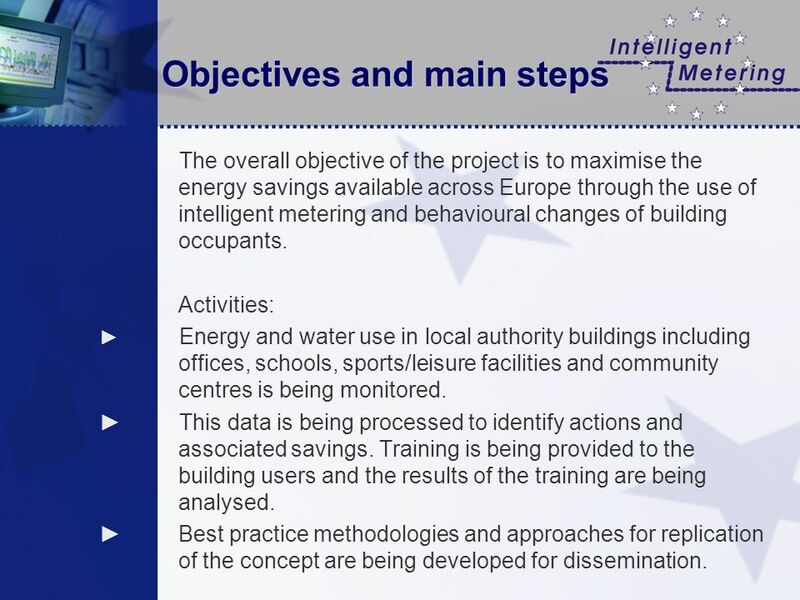 Activities: Energy and water use in local authority buildings including offices, schools, sports/leisure facilities and community centres is being monitored. This data is being processed to identify actions and associated savings. 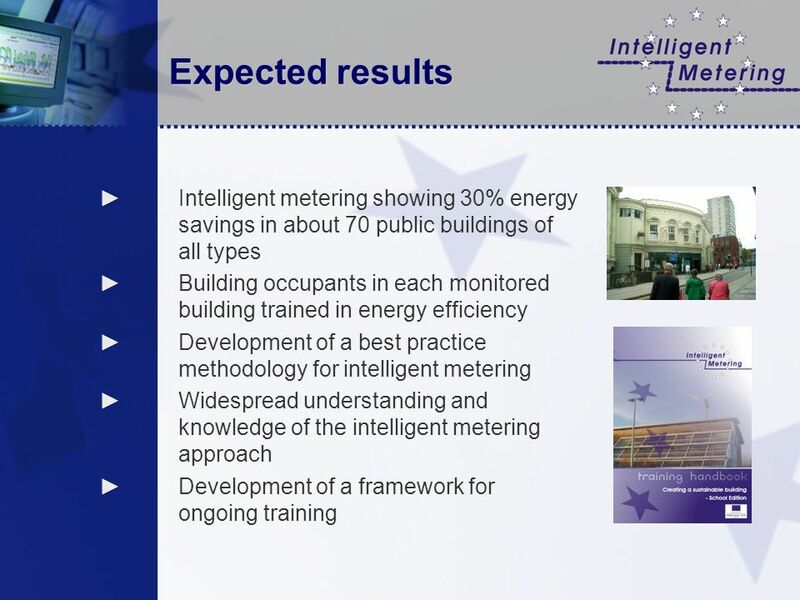 Training is being provided to the building users and the results of the training are being analysed. Best practice methodologies and approaches for replication of the concept are being developed for dissemination. 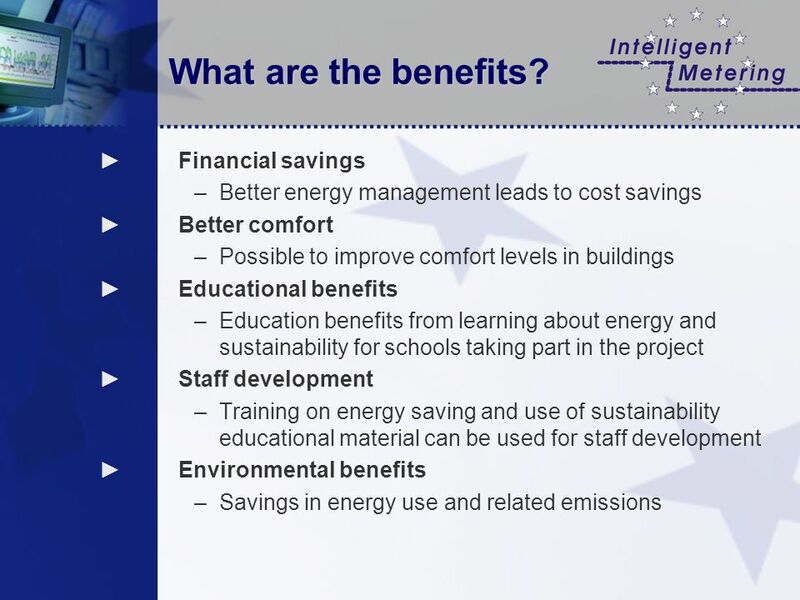 Download ppt "Energy Savings from Intelligent Metering and Behavioural Change Intelligent Metering EIE/04/107/SO7.38635 January 2005 - December 2006." 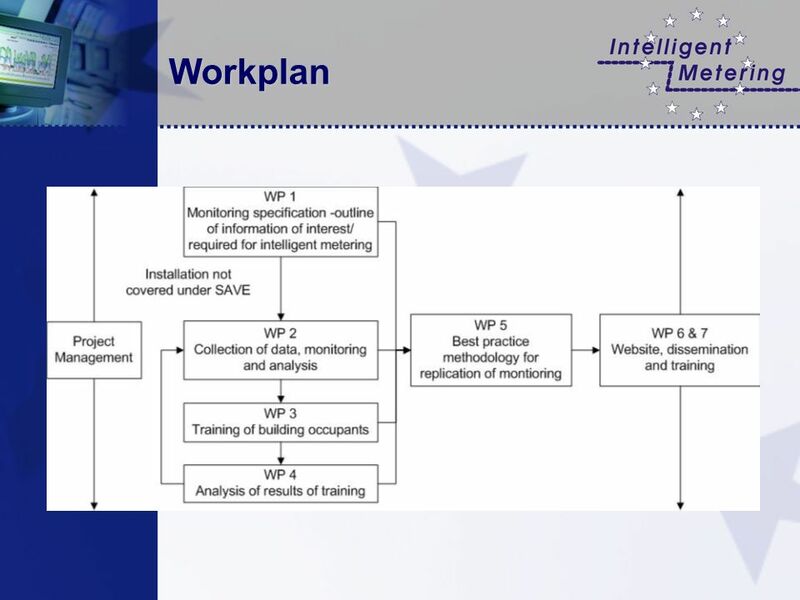 EXIOPOL Presentation March Presentation of the IP Agenda Introducing EXIOPOL –IP project –Objectives –Implementation plan –Structure. WP7 Internal Evaluation & Quality Assurance Green Employability Project StudioCentroVeneto - Toni Brunello and Paolo Zaramella Vienna, 10th January 2012. Fot. 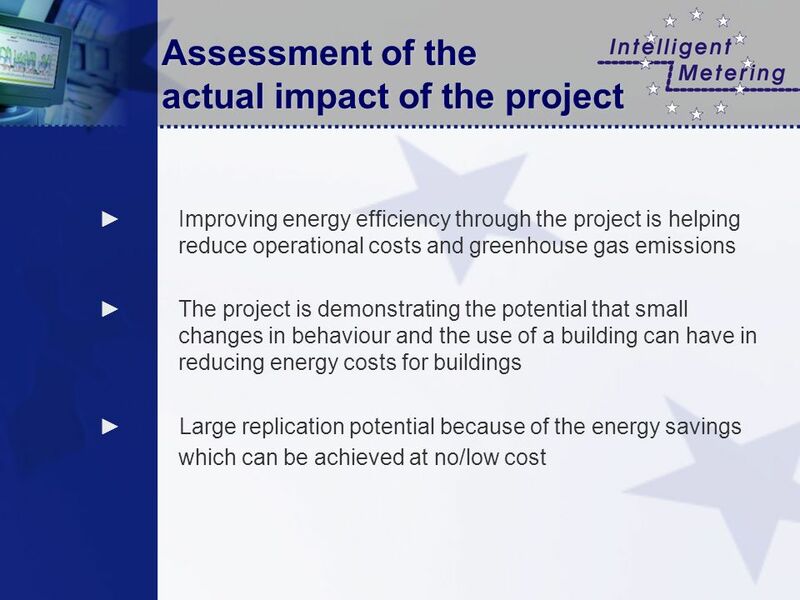 : Enea Elżbieta J. Syrda ASM – Market Research and Analysis Centre Polish Construction Technology Platform Eco Retroffiting Polish approaches. Sevilla 2007 ChangeLAB - Changing Lifestyles, Attitudes and Behaviour Sevilla 2007 Hilary Lowson Surrey County Council. The PV Policy Group Project FIRST THEMATIC WORKING GROUP MEETING Friday 07 October 2005 in Catania, Italy Presentation Markus Kurdziel & Corinna Klessmann. 1 Deploying large-scale polygeneration in industry “D-ploy” Grant Agreement EIE/06/014/SI Project duration: November 2006 – December 2008. You are a Smart Consumer USmartConsumer Contract number: 13/590/SI Project duration: 36 months (03/ /2017) Last modified: USmartConsumer. Leaders in Sustainable Energy Stewart Conway & Prakash Patel. Somerset County Council Climate Change Strategy Abigail Stretch Sustainable Development Officer. 1 RENDEV Reinforcing provision of sustainable ENergy services in Bangladesh and Indonesia for Poverty alleviation and sustainable DEVelopment January 07. GREEN DRAGON ENVIRONMENTAL MANAGEMENT STANDARD Recognising Environmental Management & Tackling Climate Change Across Wales. The SPECIAL Project (Spatial Planning & Energy for Communities In All Landscapes) Contract No: IEE/12/762 8 March 2013 – 7 March 2016 June 2013. C-LIEGE Contract N°: IEE/10/154/SI Project duration: from 1 st June 2011 to 30 st November 2013 Date of creation: 4 th July 2011 Clean Last mile.